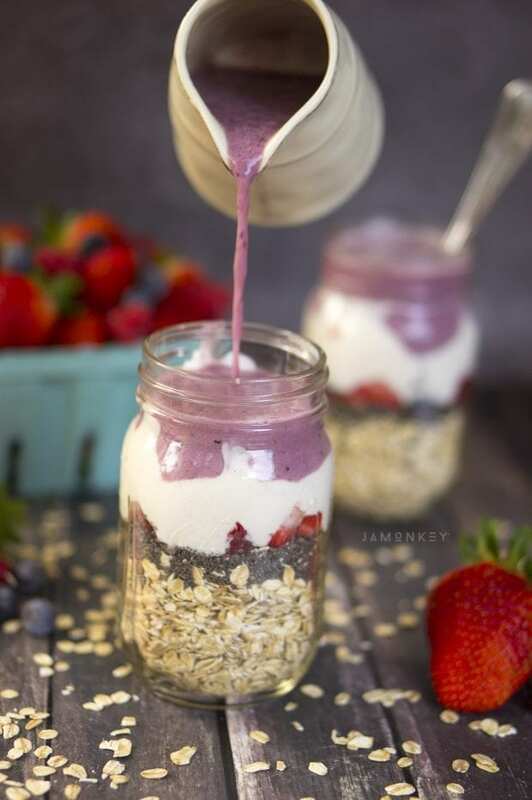 When you're looking for a healthy breakfast on the go, these Very Berry Overnight Oats are the perfect edition to your morning routine. I can't believe it took me so long to try overnight oats. I'm a fan of hot oatmeal so I think that is what turned me away, but no one told me what I've been missing! 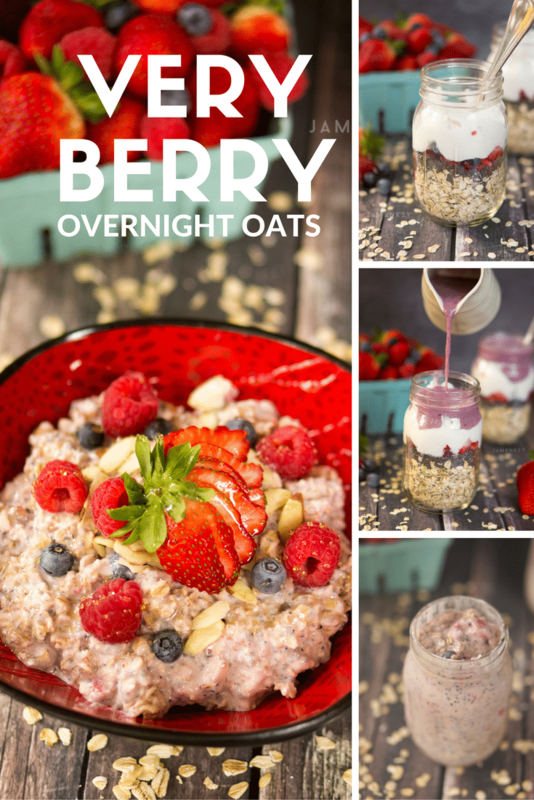 The kids and I enjoyed a bowl of these Very Berry Overnight Oats this morning, and they are so flavorful. They are also really easy to make. When you're running around in the morning trying to pack school lunches and get everyone out the door, it's nice to have breakfast already ready. 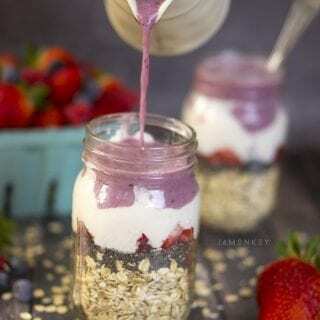 Not just ready, but a healthy breakfast that isn't a sugar filled cereal! So make these the night before and serve in the morning. Easy and done. This recipe makes two servings so that you can make one or a few for the whole family. Unless you just like large breakfasts than eat your heart out. I placed the oats into a mason jar so that I could secure the top and prevent leaks in the refrigerator. 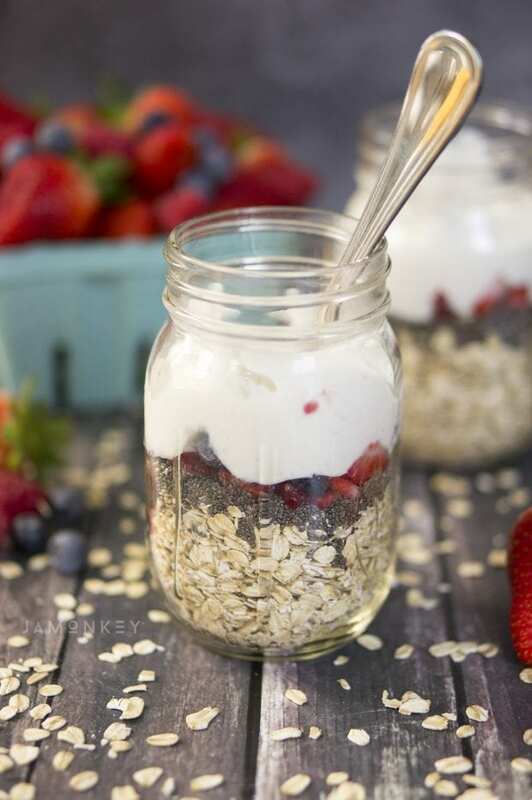 In the jar, place the Bob's Red Mill Rolled Oats, chia seeds, diced fruit, and Stonyfield Vanilla Greek yogurt. Then blend the almond milk with a handful of strawberries, raspberries, and blueberries in a blender. Pour the mix into the jar and then stir everything together to make sure that the liquid and yogurt mix with the oats and chia seeds. Seal the jar and place it in the refrigerator for at least two hours or overnight. 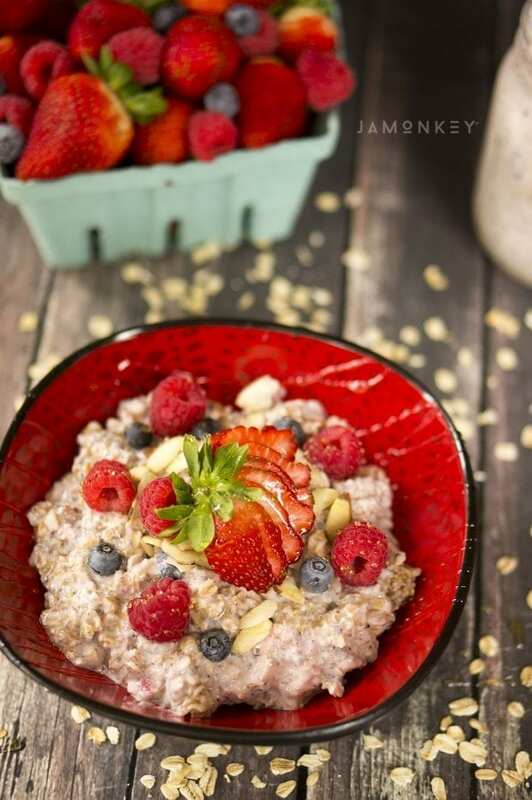 We sprinkled our oats with honey, sliced almonds, and fresh fruit. It's berry delightful. Enjoy them cold! Dice a couple strawberries, raspberries, and blueberries to place in the overnight oats. 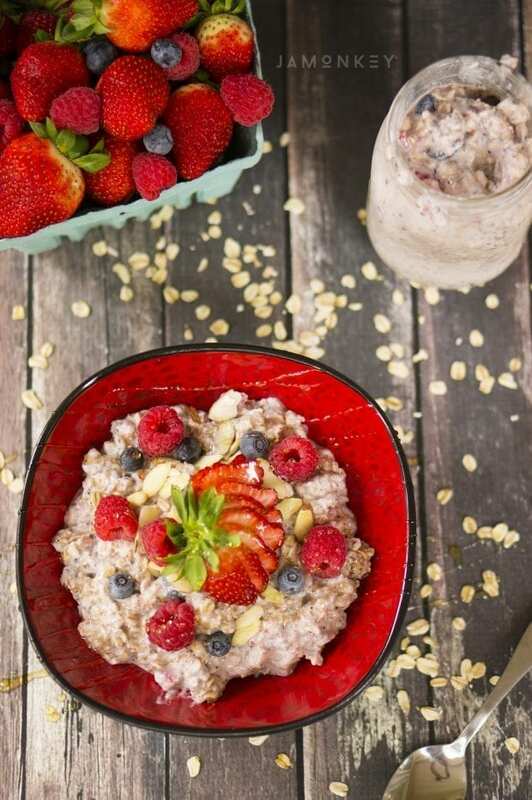 Blend almond milk with a handful of strawberries, raspberries, and blueberries. 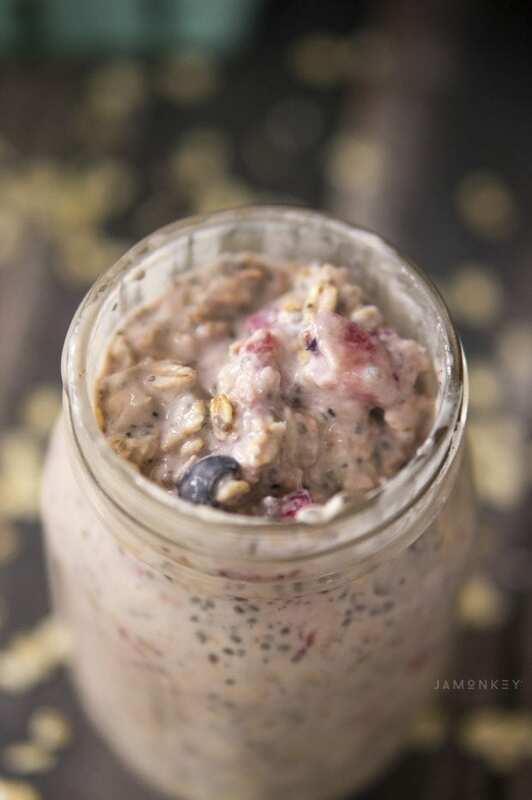 In a mason jar or container with a tight lid, place the oats, chia seeds, diced fruit, Greek yogurt, and fruity almond milk. Secure lid and place in refrigerator for at least 2 hours, or overnight. For the fruity almond milk blend, I used about 4 strawberries, 1/8 blueberries, and 1/8 raspberries. When you pour the mix into the jar (and mix) you may have some left over. It makes a tasty smoothie. I am a Stonyfield Organics Blogger. All thoughts and opinions are my own. OMG that looks AMAZING. yumola! I did overnight oats in grad school all the time, but I forget to do them nowadays.